1.1 1. Clean your razor in a little cup of soapy water. 1.2 2. Dry your razor by shaking away then excess moisture the wiping it off with a towel (or in my case, a microfiber cloth). 1.3 3. 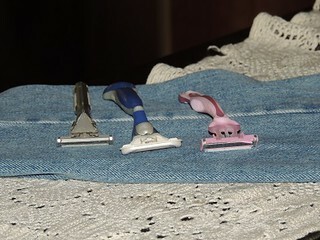 Going in the opposite of your normal shaving direction, run the razor across some blue jean material about 20 times. 2. Dry your razor by shaking away then excess moisture the wiping it off with a towel (or in my case, a microfiber cloth). These are the razors I used for testing. All were old and dull. 3. Going in the opposite of your normal shaving direction, run the razor across some blue jean material about 20 times. This is called stropping. Remember, you want to run the shaver backwards! That’s it – easy peasy. When I was done sharpening the razor blades, I handed the Survival Husband his razor and told him to give it a try. Now let me say this: he was doubtful to say the least. The first words out of his mouth were “Wow, this is really sharp”. I asked him how old the blade was and he said about a month. It was ready for the trash any day now. As part of my research, I came across the following YouTube video. It demonstrates the process for you and although the author refers to sharpening a disposable razor, in my tests a standard razor (not the disposable type) worked equally well. I like to save money just as much as the next person. As near as I can tell, refill razor blades cost over $2 each. Let’s say you can get one month’s use out or each. That would be $24 a year. If you could double their life by sharpening the blades on a pair of blue jeans, you would save $12 right off the bat. How many times can you re-sharpen the razor blades? Time will tell but if you ask me, my best guess is that you can re-sharpen then at least twice, if not more. It certainly is worth a try. What started out as a great Wednesday shortly turned into a bloody mess. The short version of the story is that Shelly, aka the Survival Husband, decided to touch up his bald head with a dull razor blade. What happened next was a scrape about one and a half inches long and a half inch wide. Who would have thought that so much blood could pour out of such a small wound. I grabbed some gauze to soak up what I could, then dabbed on some boo-boo stick followed by miracle slave. While he held a clean piece of gauze in place, I grabbed the first aid kit and used a chunk of 1″ stretch wrap bandage aka “Vet Wrap” to hold the gauze in place. Although he looked like a dork for the rest of the day, the bleeding stopped and we were able to remove the makeshift bandage at bedtime. Whether it was his great healing powers, or the essential oils in the Boo-Boo stick and salve, by the next morning, there was barely a scar. When all was said and done, he got a harsh scolding for using a dull razor blade. There is absolutely no excuse for that since sharpening your own razor blades only takes a minute or two and is a cinch. All you need is scrap of old denim. Need the recipe for Boo-Boo Stick? You can find it here: Make Your Own Healing Boo-Boo Stick. Bargain Bin: Stock up on a small supply of razor blades then sharpen them yourself! Check out these and a few more items related to today’s article. Gillette Sensor Excel Razor: This is an extremely popular razor. According to the reviewers, it is difficult these days to find it locally. Shelly (the Survival Husband) uses this razor with the 3-blade refills. Gillette Mach3 Men’s Razor Blade Refills 15 Count : These are the refill blades that Shelly uses. He has not felt the need to go beyond the 3 blade type of razor. Can you imagine giving these the longevity of 30 or even 45 blades? Gillette Sensor3 Smooth Shave Disposable Razor 8 Count : Many folks prefer disposable blades but personally? Although we use them, we like the heft of a traditional, non-disposable razor. Amazon Basics Microfiber Cleaning Cloth, (Pack of 36) : No list of DIY cleaning supplies would be complete without these wonderful microfiber cloths. They will last you for years and will allow you to replace paper towels forever. Truly. I color code using blue for glass and windows and the other colors for everything else. I love these. They are not as “fuzzy” as the Z-wipes. I have both types. Spark Naturals Essential 4 Pack: This 4 pack includes some of the most popular essential oils for everyday use, including lavender, peppermint, melaleuca (tea tree), and lemon. Another option is the “Health and Wellness” kit that comes packaged in a tin and includes a brochure with suggested uses for each of the oils. As kits, these oils are already discounted but as an added bonus, you get an additional 10% off with discount code BACKDOORSURVIVAL at checkout. Dr. Bronner’s Magic Soaps Pure-Castile Soap: Of all of the Dr. Bronner’s castile soaps, tea tree is my favorite. I prefer to purchase the versions are already infused with essential oils since it does save me a step when concocting my own cleaners. A little goes a long way with a favorite use being DIY Foaming Hand Soap. Color Me Calm: 100 Coloring Templates for Meditation and Relaxation: Those of you that follow Backdoor Survival on Facebook know that I have become a coloring maniac. This book is my latest splurge and what a fantastic adult coloring book it is! This is another one of my favorites: Balance (Angie’s Extreme Stress Menders Volume 1) Yes, I am totally addicted. Why color? Read Nine Reasons Why Adult Coloring is Important to Preppers. Colored Pencils 36-color Art Drawing Pencils: This is the first set of pencils I purchased and they have served me well. I paid about $15 for the set but see that as of this writing they are less than $10. I can also recommend this set of 72 colors from Prismacolor. More expensive, yes. But really worth it for coloring scenes where you want to do a lot of shading. Need something from Amazon (and who doesn’t)? I earn a small commission from purchases made when you begin yourAmazon shopping experience here. You still get great Amazon service and the price is the same, no matter what. Bought some of the freeze dried salmon and cannot find a recipe for it. please share if u find some good ones. I use more expensive 4 or five blade razors and sharpen them after every use. A blade usually last me at least a month. I use a scrap piece of leather to strop it. @Jerry – I plan to make a smoked salmon dip and some salmon patties. I will post the recipes on the Sunday Survival Buzz after I confirm how they work out – unless you would like them sooner? Wow, great article! Thanks! I’ll be sure to try it out! To dry a blade pour a little alcohol on it. Everything I read about dealing with the zombies is that I need to blend in. If I run around without whiskers, and not loosing weight, they will know I am different. I will grow whiskers. It is funny that you speak of lipstick and blush. Selco posted a great article recently about the rescuers of the Jewish prisoners in the death camps in the second world war. They passed out lipstick to the women. It was said that this brought them back into humanity. Women that were so starved that they were nothing but skin and bones, with no clothes, walking around with lipstick and a smile on their faces. I would have never imagined. I agree with you John. Bet you that growing a beard will actually became fashionable when there are no more razor blades around. I feel for the ladies though. If they cant wax it, they’ll probably will have to cover it up. Hey John R: It is funny that Palestinian children react similarly to themselves and their parents not being beaten, shot and thrown out out of their homes by Jewish squatters. 1. I heard many years ago that stropping is NOT sharpening, but only straightening and smoothing. You have seen them do it in western or old time movies. i.e. “the color purple”. The person who was giving the info said they kept referring to it as sharpening when they were smoothing. Even my dictionary has it wrong. Razors are the thinest blade and get nicks and bends very easy from just human hair. That is what is cutting you. It is not dull. From wikepedia: A razor strop is a flexible strip of leather or canvas used to straighten and polish the blade of a straight razor, a knife, or a woodworking tool like a chisel. Unlike honing or sharpening a blade, in which a whetstone removes metal bent out of alignment from the blade’s edge, stropping the blade re-aligns the indentations without removing any material. Manufacturers will not tell you this, because they can sell more product. 2. I have been doing this for many many years now. But I use my thumb while I run water over the blade. It also cleans the blade at the same time. (admittedly, I am only getting a partial cleaning) I can usually get up to 4 months on just ONE blade. I can tell when it finally becomes dull. first it takes more and more strokes to get a close shave. Then at some point the blade will ‘tug’ just a little before cutting the hair. That is when I dispose of it. Just a word of warning: when transistioning from an old blade to a brand new one, go light on the strokes. As the blade does become more dull, you will instinctively apply more pressure to get the cut. If you apply that much pressure on a brand new blade, you will get bad skin cuts. When you sharpen a blade, you roll over a very fine edge, stropping removes that edge! Many months ago I purchased a RazorPit for this very purpose and it works ok but then somebody told me I could just use a pair of blue jeans (or something similar) and get the job done too… wish I’d known that before I spent $20! Another is to buy Wilkinson Sword razors or blades. They are available at Walmart for less than half the cost of Gillette. I haven’t found them anywhere else. I hadn’t seen the brand since the ’60’s – I used to buy them at the PX when I was in the Air Force. They are very sharp! Be careful the first time you try one. They also seem to last longer. have you tried the entrees?? i have been looking at the various brands of emergency foods and i’m really wondering about taste….. if things are bad enough or if it’s just a month long disaster i would be glad of anything to eat. but tasty sure would be better!!! @Echo – I have tried the entrees. They are actually pretty good and much better than boxed stuff (such as hamburger helper and the like). Also, I have found the serving sizes to be pretty accurate although just to be safe, I often cook up 3 servings for the two of us. At the prices right now, cooking from food storage is cheaper than making the same thing from scratch (by the time you go out and purchase all of the ingredients). One thing I am not real fond of are the desserts although the ice cream sandwich is really good. I’m all for saving money during normal times, but when TSHTF, I don’t think I’m going to be worrying about shaving my legs. Get an ‘old fashioned’ double edge razor that uses the double edged blades. The whole concept of more blades equals more awesome shave is a little bit correct and whole lot of bunk. You should be able to get 4-6 weeks out of a single blade without any special care. If you take the blade out and strop it by running it back and forth on the inside of a glass (real glass not plastic) you’ll get longer results. 100 blades runs about $10-12. That runs you about $1 a year on shaving without any extra care. Maybe .50 a year if you clean and strop the blade once every couple of weeks. My grandfather, back in the ’50’s, used to “strop” his double edged blades on the inside of a drinking glass. This is cool !!!!!!!!!! that has been a constant bane for most men , constantly going through disposable razors . I find that a NEW razor , rather than a dull one will cut you up faster , I do this once in awhile when I forget that I just swapped out the razor and I dont have to bear down so hard . I agree with Paul Anthony, buy Wilkinson Razor blades at Wall Mart. They’ve been around a LONG time, quality material, and they’re made in U.S.A.! Look at the country of origin on all the others and you’ll see they all come from over seas! The consumers of this distressed country can make a difference by supporting what’s made in our own back yards! You all talk survival and independence, now back it up with home products to get this country back on track! The journey may be long and hard, but it all starts with the FIRST STEP! I’m all for buying “made in the USA, but I use Wilkinson, and they are not made in the USA. Thanks for this article, I have loads of old blades to give this a go on to see if I can resharpen. The savings would be a a lot more than $2 here in the UK. blades here cost between £5 and £8 a standard size pack. I always wear a leather belt. Can be used quite effectively as a impromptu strop if you just need to touch up a blade or razor. I have been using a “Razorpit” for two years now and I get THREE monthe out of a blade .I discard after this time so I don’t know how long one could last. Another technique is to strop the blade on glass under water, this old tip worked in the 50’s and sharpens as well as stropps. Back in the 70’s there was a commertially availabe pyramid that you kept the razor blade in and somehow it remained sharp!Don’t ask me how but it was very popular in Russia . I will have to add this to make tricks. I buy one razor a year. I clean it after every use and once a week treat it with a Qtip and baby oil. i could probably have it last longer but I get a new one for my birthday. i am new to your blog but am thoroughly enjoy it. Can’t wait for the Kindle links. Lawrence – Because the free e-books are only online for a day or two, I post the links only on my Facebook page. Just so you know . . . I always rinse my blades with water while shaving, but then when I am done I give the shaver some quick flicks and then I rinse it in a jar of 91% isopropyl alcohol. Another great tip to keep your razor blades from getting dull in the first place is to dry them off thoroughly after each use. I only go through about 3 blades for my Gillette Fusion per year. Now I might be able to use only one a year with this tip. Thanks! I heard a loooong time ago to use only cold water on your blades as the hot water will tend to take the temper out of the blade.. I wonder if this trick works for scissors? To sharpen scissors, fold a small piece of aluminum foil over about 4 or 5 times then cut through with the scissors 9 or 10 times. They will sharpen up nicely. I used to sharpen my scissors with folded up foil. It works, but it wastes good foil. Then I decided to try using a well-rinsed out aluminum soft drink can instead. I simply start by poking a hole at one end and cut the can just like you would peel and apple when you keep the peeling in one long strip. You don’t waste any usable foil. And if you usually recycle your aluminum cans, you can still recycle the can after it has been cut into strips. That is a great tip and something I will try. I typically use old, repurposed foil that I save for scissor sharpening but the soft drink can sounds better. I can crush the can then snip away. BTW, I have tried this method of snipping through foil with my garden shears but have had only marginal success. I really do need to learn how to sharpen them on my own. That’s all fine, but the premise is misleading. Razor blades are actually quite cheap; it is disposable razors that are expensive. Another tip i have been using for several years also will extend razor blades up to from 6 – 10 1/2 months on a single razor with no strapping at all. All you have to do after use is to rinse it well under water, immerse in a small container of vegetable oil, shake for a second and leave the razor in the oil until the next use. The blades must be under the oil level. I use a small pimento jar with olive oil. I got this tip from a friend who works with the man who invented and holds the original patent on the technology for ‘coating’ razor blades in a special process which allow a very hard coating on an extremely thin metal surfaces. He says the blades don’t get dull they get dirty with skin and hair particles too small to see. I use one of those razors with 3 or more blades. After about a week you will begin to see the accumulated junk in the bottom of the jar. When you take out the razor, let the oil drain for a second so don’t lose too much oil for each shave. When the oil level gets down low enough to expose the blades i throw out the oil, rinse out the junk and replenish the oil for another 3-4 months. I usually use about 1/3 of a cup of oil for each razor usage over time. My longest razor has gone 10 1/2 months, shaving once per day. You time of use will depend on how much dis-comfort you tolerate before you got for a new razor. I will start using this strapping process and see how long a single blade can last! Roy – What a fabulous tip. I will share it on a future Sunday Survival Buzz – and try it myself, of course. Thanks so much! One thing you might consider is to buy a straight razor, a hone, and a strop. Its going to be a lot cleaner than a multi-bladed thing that will collect skin and whiskers, and that can only be sharpened only so much. A straight razor provides a much better shave, and its something you can keep sharp forever with only just a couple things. Your grandson will be using the same razor, hone, and strop. For those who don’t want to use a straight, you could also consider a double edge razor. The single blades for it cost less than 5 cents, and they stay sharp longer. Another idea to save money is the safety razor. The razor itself can be bought for $20-30 on Amazon. The blades are incredibly inexpensive and can last a week (longer if you only shave every other day). I bought a couple of hundred of them for around twenty bucks, which should be enough for a couple of years. Oh, the shave is great, too. Exactly. The multi-blade razors cost so much because they are multi-blade razors. The double edge blades are cheap, and you get a much better shave with it. Another alternative is a straight razor. There is a bit of upfront cost but essentially, you get a great shave and one razor could/should last forever. Plus, it’s old school….you don’t have all that useless packaging to throw away etc. An intermediate step is a safety razor and one can use the same stropping technique, I just use a hand towel, that is documented in this article. I can easily shave for a month on a single double-edged blade. And, if you use the four pass method (down/l to r/r to l/up) the shave will be so close you will not have to shave every day. 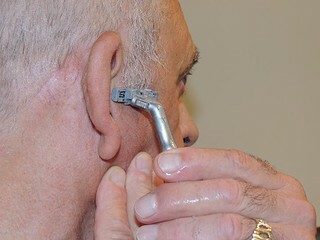 You will never get that close a shave with an electric or a cartridge razor. Anyway, good article…..lots of good, old-fashioned ideas. Any money we can save is appreciated. If you have more tips stashed away like this please recycle. It’s great idea, and I use something very similar, the inside of my left arm. I strop the razor in the same manner 4 to 6 times before shaving and have had great success. Mine is a double bladed thing with a teflon guide. After about 4 months the teflon things wear out and fall off which doesn’t effect anything. One addition step is to ALWAYS clean and rinse the blade in the shower head or faucet to remove any hair and soap to prevent corrosion of the blade. After rinsing blow the water out of the blade, rinse and blow it out again from both directions. I found it easier to just grow a beard and then trim with a scissors if it gets too unruly (grin). This was one of your most useful tips you’ve ever posted, Gaye. In the past few months, I have probably saved at least $40 because I haven’t had to buy replacement blades for my razors. I certainly can use that money for more useful things. Thank you! I took another option: I had my beard destroyed. No more shaving, not for 35 years. buy more,do I get a discount ? Your sugesetion about resharping the blades sounds great.Thanks for the tip. I will try it. We used to prolong zip-knife type razor blades by sharpening them on glass. In a pinch, an extremely smooth piece of concrete can be used but glass will produce the finest edge. Kat, make sure the denim you’re using has been washed a couple of times. This will get rid of that junk. You might want to wash it after every time you’ve stopped with it. I will definitely try this. I’ve been trying to figure out how to strop my razors for years. I usually get 4-5 months on a cheap disposable razor. My trick is to keep a small bottle of mineral oil handy in the shower. When I’m done shaving in the shower, I put a drop of oil on the blade and tilt the blade to let the oil coat it. The oil pushes away the water and keeps the air from getting to the blade, preventing or minimizing oxidation (rust or corrosion). Great how-to on extending the razors life, although leather is the best to use. Even a belt if it’s real leather, and a straight razor would be perfect for SHTF, only stropping is needed to sharpen the blade, and a quality one will last a lifetime. Just use a straight razor. I’ve been using a 100 year old straight razor for about ten years now. I paid $15 for it on ebay. This one razor will last generations. And I never have to resharpen it. All I do is strop it before every use. I use a balsa wood strop that I cover in chromox buffing compound which is essentially a giant green crayon with super fine particulate in it. I bought it when I bought my razor ten years ago, and in that time I’ve used about 1/16th an inch of a 4″ stick. Stropping on newspaper also works incredibly well. Apparently the micro texture of the printed text acts as a fine buffing compound. Great article! Gaye has taught us how to repair and reuse disposable razors, just as she taught us how to recharge batteries and discover that many old batteries still have life in them. Loved the antibiotics quiz. I got one answer wrong. Meat is a big problem. I tried being vegetarian but it weakened me, even with eggs, dairy abd vitamins. Then I spent A LOT of money on a free-range, grass fed, grass finished leg of lamb. It was hard work cutting it into portions for the freezer but it has been worth it. I only need meat once or twice a week. That small about of lamb has definitely improved my health. As for the choice of lamb, in case anyone is wondering, it’s the only meat I like. I know you hate to give up your island home, but certainly understand. A friend lived on Hat Island and medical issues necessitated them to relocate to the mainland. Those island locations are beautiful, BUT! Will you still migrate to AZ for winters? I live here in AZ full time and this year has been a doozy on “warmth”! LOL. We always enjoy the end of the 5 month summer spell. Best wishes for a quick sale to your liking and finding a new retreat location. Affirmative. We love Arizona including the people and a culture that does not automatically embrace the rules (if you know what I mean). Gaye, I gave up disposable razors long ago. I use a double-edged safety razor. The blades are disposable, true, but the metal handle is not. The blades can be stropped, but they are so cheap compared to the fancy 3-blade wonders that I usually don’t bother. But since they don’t have any fancy “moisturizer bars” or plastic parts to degrade, you could sharpen it for a long time. I got mine at an estate sale. They have gotten hard to find–they’re in vogue–but the bald guy from the pawn shop show is hawking them for about $20. But once you have the handle, you can get a 10-pack of replacement blades at Walmart for less than $5. The shave is the best I’ve ever had short of a barber. It’s a little different technique, since you don’t want to press down like you do with the disposables, but it’s clean, and with a good shaving soap and brush (I don’t use the canned stuff anymore), I don’t get any skin irritation. I know of men who shave their heads with them, too. It isn’t quite true that mice won’t chew on anything that doesn’t smell of food. As they are rodents like rats, they have continually growing front teeth for gnawing that have to be continually worn down against each other and against what they chew, and so they sometimes chew on other things to do that when their diet isn’t enough for that, the way rats notoriously chew on electric wiring. One of the causes of German failure at Stalingrad was that heroic Soviet mice had holed up to hibernate in German tanks that had been laid up for the winter and chewed up their wiring! But I doubt if mice would chew soft mylar bags that way, though they might chew the plastic buckets holding those. They WILL chew thru Mylar bags. Made the mistake of leaving a smaller bag out on basement pantry shelf, was resorting a bucket, phone rang, and I missed putting that bag back into the bucket. Guess what? Yup, next day Macaroni noodles ALL over da place LOL Lesson learned the hard way! This is a great thread on what mice will chew through. I would love to hear more on readers’ experience with mice, bugs, etc in food storage. My husband wants to take all my stored food and shove it under the house. I am not comfortable with this. I have not had issues storing food products under the house. That said, the area is not damp and everything is is Mylar bags stuffed into buckets. In the beginning, I used dCon (sorry, I know it is toxic but you need to do what you have to do). The mice must have got the hint because now when I set out a tray of bait, it is still there 6 months later. I did stock up on it (dCon that is, while the old formulat was still available. I need to check to see what, if anything, you can currently use that will be equally effective. I’m really glad to hear mice have not gotten into your buckets. For under the house I would like to get water tight coolers. Expensive but thicker than buckets. I have NOT run out of space in the house. My husband just thinks my buckets are clutter. Double edge razor blades can cost less than $10 for a hundred. And a vintage Gillette razor will outlive you. Just sayin’. with our favorite waiter who is studying nursing. He told us that he knew a man who lost 1/3 of a finger and regrew is with tea tree oil. I have no reason not to believe him but I could not find anything as miraculous in my searches. I have a great suggestion for your first aid kit. It is CAYENNE PEPPER. Putting cayenne on a cut will slow and stop the bleeding. When consumed in capsule form it is stimulant that is not an irritant. It can stop a heart attack. Just google it and see. There is so much out there on it. No one should be without it. I have been a small time lone prepper since 2000 but living in the NE with 4 seasons it is more challenging than the south and west coast. Keep the faith. You’ve got to try the Dollar Shave Club. New razors mailed to your door every month. They cost a fraction of name brand. I’ve stocked up on these and have enough to last over a year now. Will try the sharpening technique, but at the prices from DSC, no need to waste my time. Besides, I can be a handsome Viking! Please consider correcting this statement. Dull blades are not more likely to cut you than sharp blades. Would you rather be attacked by someone wielding a sharp knife or a dull knife? What’s more dangerous? An animal with sharp claws or an animal with dull claws? If you think about your experience shaving you’ll realize that nicks and cuts usually happen when you break out a new razor, not when you continue using an old one. Because sharp things cut more easily than dull things. Sorry for the snark, but this is a pet peeve of mine. End rant.